No More Empty Promises, Say Immigration Activists Descending on D.C.
Upwards of 100,000 people are on their way to D.C. to voice their collective frustration with America's broken immigration system and demand immigration reform in a massive march Sunday. Photo: Campus Progress. A high school valedictorian with a perfect 4.0 now excelling in college: a strong candidate for a Fulbright scholarship, said a college adviser to Jose Diaz. But you need a Social Security number to apply, and Diaz doesn't have one. So much for this model student. Diaz is an undocumented immigrant. He says he can't be guilty for what his parents did—emigrating to the U.S. because they felt like they had no other option. Diaz's parents migrated to the U.S. when he was nine (editor’s note: we’ve changed his name). Frustrated, Diaz organized a group called One Michigan, which grew from a small group to 200 supporters in three weeks. And this weekend they are heading to Washington, D.C. They'll be just one organization of many on their way to D.C. Activists from around the nation are mobilizing to voice their collective frustration with America's broken immigration system and demand its reform in a massive march. Hundreds of groups are building for the march, which organizers expect will attract upwards of 100,000. 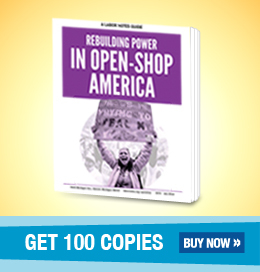 Worker centers, immigrant community organizations, faith groups, and unions like the UFCW, SEIU, UNITE HERE, and the AFL-CIO federation are mobilizing their members. Reform Immigration for America (RI4A) is helping coordinating the wide range of groups. Immigrant rights groups hope the march forces immigration reform onto the agenda of a White House reluctant to take up the issue. Advocates say their communities couldn’t wait any longer. Under the Obama administration, repression against undocumented workers has escalated, says Christine Neumann-Ortiz, executive director of the Milwaukee worker center Voces de la Frontera (Voices from the Border). Deportations by federal immigration officials rose 13 percent between 2008 and 2009, climbing to 298,401. “Frustration is increasing,” she says, noting that activists have staged fasts and civil disobedience over deportations and big protests over round-ups in Arizona. Even inside detention centers people swept up for deportation are protesting. On January 19, about 100 detainees went on a prolonged hunger strike to protest conditions at a federal detention center in Manhattan. Putting on a big march helps immigrant rights’ groups organize for the long haul, advocates say, by mobilizing immigrant communities and bringing the issue to a national stage. Voces de la Frontera took to the road in March for a five-city tour highlighting unemployed and undocumented workers. They’re building pressure for immigration reform and jobs, highlighting fights to save existing work—for county workers in Milwaukee, and for 1,000 IUE-CWA members at Whirlpool in Indiana protesting their plant closing—before joining thousands descending on D.C.
Asian American and Pacific Islander Americans are mobilizing, too. Eun Sook Lee of the National Korean American Service & Education organization notes that more than 18 percent of Koreans in the United States are undocumented. NKASE and its members will be leading traditional Korean drumming at the front of Sunday's march, and a short Asian & Pacific Islander American rally will precede the main event. The New York Immigration Coalition is coordinating the 200 buses traveling from across New York state. The community organization Make the Road by Walking in Brooklyn is sending 40 of them. Another 120 are taking off from Chicago, 25 from Ohio, 15 from Michigan, 5 from Indiana, 1 from Iowa, and 3 from Wisconsin. About a thousand buses are leaving for D.C. from around the nation, says RI4A organizer Ryan Bates. “But we need to do more than just march,” says Martin Unzueta, director of Chicago Communities and Worker Rights. He and other advocates who helped propel massive 2006 May Day rallies have a few ideas on that. Employers take advantage of 12 million undocumented people in the country—one of every 20 workers—to drive down wages and working conditions as fearful undocumented workers don’t reach out for help, afraid of deportation. Take the example of Omar Damian Ortega, one of the workers on the Voces de la Frontera tour. He was charged with “identity theft” when he filed a workers' compensation claim for a back injury. Instead of paying his claim, the insurance company, West Bend Mutual Insurance, investigated his immigration status. Workers involved in organizing drives are particularly vulnerable. One organizing attempt at a big non-union employer in the New York grocery industry was squelched in 2007 when federal immigration officers raided the Fresh Direct warehouse right before their union vote, sending panicked workers into the shadows. Tolerating these situations slowly creates a “permanent subclass of people disenfranchised and working in poor conditions with low wages,” says Lee. Obama walked into the Oval Office with 67 percent of the Latino vote. So what of his promise to make reform "a top priority" in his first year as president? With only a few months left before Congress breaks for summer and midterm campaigning begins in earnest, immigration reform activists don’t have much time to find a way to make immigration reform happen. Wide gaps remain between the demands raised up by grassroots activists and the legislative concepts Democrats have proposed, complicating matters. Unzueta and others don’t support measures Democrats have put forth, like the E-verify system. It lets employers use government databases to check names and Social Security numbers. Advocates see it as a weapon employers use to criminalize work done by undocumented people, depressing wages and forcing immigrants into dangerous and unregulated jobs. RI4A's Bates says the challenge is coming up with immigration reform legislation that will be supported by grassroots immigrant rights activists as well as Republicans and Democrats. Other advocates note that Senate Democrats are already negotiating with Republicans on immigration. They maintain that without grassroots pressure, the deals made will only get worse. Neumann-Ortiz says her group will be pressuring the president and key senators to make a public statement committing to pass immigration reform this year. She predicts negative consequences at the polls for Democrats, from local to national races, if they take immigrants for granted. A recent report from the immigration reform group America's Voice outlines 40 congressional and gubernatorial races where Latino votes may be a deciding factor, including Senate races in Illinois, Arizona, Florida, California, New York, Colorado, Connecticut, and Nevada. Other activists are talking about putting some heat on the streets. Jorge Mujica, policy director of the Guadalupe Mission in Chicago’s Little Village neighborhood, said there’s talk about boycotts, May Day work stoppages, and other measures unless a comprehensive bill is approved this spring. “In this country, change doesn't come from the top down,” Obama said while campaigning for president. “It comes from the bottom up.” Immigrant advocates are taking the president at his word. Immigration reform and workplace issues for immigrants will be front and center at the Labor Notes Conference. A Latino Workers Track, sponsored by the Labor Council for Latin American Advancement, will meet Friday, April 23, with a full slate of bilingual workshops. Contact guerrero [at] labornotes [dot] org for more information.